Sitting literally at the crossroad of Chapel Hill and Carrboro, St. Paul African Methodist Episcopal Church has been a community fixture for nearly 150 years. Among the congregation's vision for the next hundred plus years is St. Paul Village - a multi-use and multi-generational development that will provide amenities and resources to the Chapel Hill-Carrboro community as well as fulfill the church's need for expanded worship and fellowship spaces. ​St. Paul Village Community Walk and 5K Run! "Walking (and building) By Faith"
The project will be located on 20.4 acres at the corner of Rogers Road and Purefoy Drive, a historically African American neighborhood that dates back to the mid-1800's. 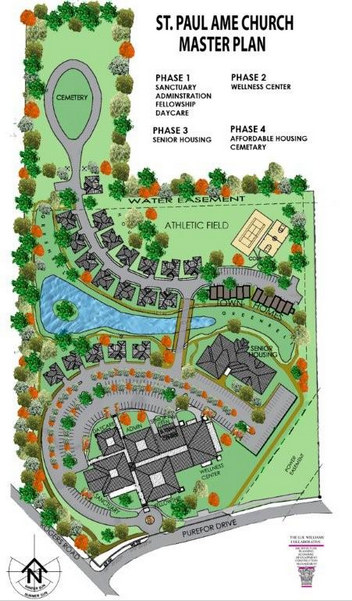 The proposed site plan, to be built in phases, includes a new worship sanctuary and fellowship hall; mixed-use senior and affordable housing; childcare, youth, and senior centers; recreational facilities; a wellness center; a health clinic; an historical museum; and a memorial garden. By balancing spiritual and physical health as well as providing educational and housing opportunities, St. Paul Village will help bring babies through senior citizens together while supporting and promoting the stability of the Rogers Road neighborhood—socially, economically, and culturally.